Living a Fit and Full Life: Snack on Go Organically Fruit Snacks for a Delicious Snack the Whole Family Will Love! Snack on Go Organically Fruit Snacks for a Delicious Snack the Whole Family Will Love! 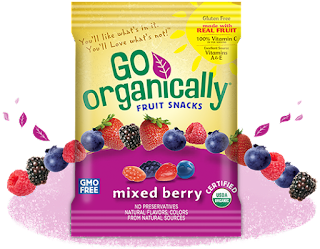 At Go Organically®, we believe Fruit Snacks should be made with Real Fruit. We source USDA certified organic fruit and other ingredients to offer you the best, most authentic and delicious snacks for your family. Please try all of our mouth-watering varieties for a taste experience you can feel good about. The USDA organic seal on our package means the product is certified organic. You can be confident that every one of our products have been certified organic by a USDA approved auditor. Also available in Fruit Medley and Tropical! Snack on Go Organically Fruit Snacks for a delicious snack the whole family will love! I made the mistake of eating on of these delicious Go Organically Fruit Snacks when the kids weren't around and boy were they good. One packet turned into two and I quickly had to distract myself before I ate the whole box. After my kids ate lunch I let them try a packet and they loved them. I love that they're made with real fruit! I also love that they're organic and that I don't have to feel guilty giving my kids a treat since they're made with real ingredients and contain no preservatives or artificial colors. They're a terrific source of vitamins A, C & E and come in multiple flavors. 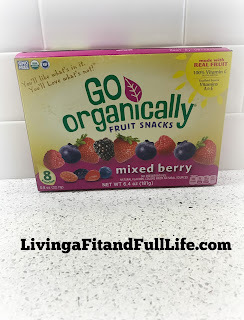 Go Organically Fruit Snacks are the perfect treat and they taste oh so amazing! 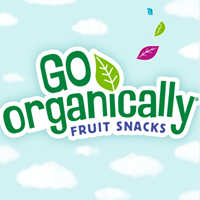 Click HERE to find a store near you that sells Go Organically Fruit Snacks! Click HERE to learn more about Go Organically! Follow Go Organically on social media!